He’s shot pool with Sean Penn, road tripped with Wes Anderson, and courted Carmen Electra. In his new book, L.A. Man, Joe Donnelly ’86 takes readers along on past adventures with some of the most recognizable people in the world. He also introduces readers to underground artists, surfers, skaters, and even some outlaws who have made their marks on the cultural landscape, as well as an intrepid wolf who changed California. This anthology of profiles represents mile markers in Donnelly’s journalism career with publications like the L.A. Weekly, Bikini, Los Angeles Times, Slake, and The Surfer’s Journal. “Joe Donnelly gravitates toward characters who have heart and portrays them with insight and humanity,” writes the Atlantic’s Conor Friedersdorf. The cover design of L.A. Man (Rare Bird Books) features palm trees that are intended to form a Y between the A and the M. “It was meant to subliminally [read] ‘layman’ … the message was, journalists are laymen,” Donnelly says. 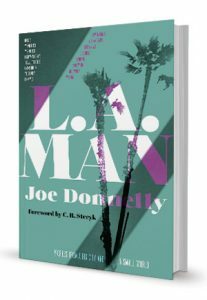 As the book title suggests, L.A. Man is as much about Donnelly as the stars he spotlights. 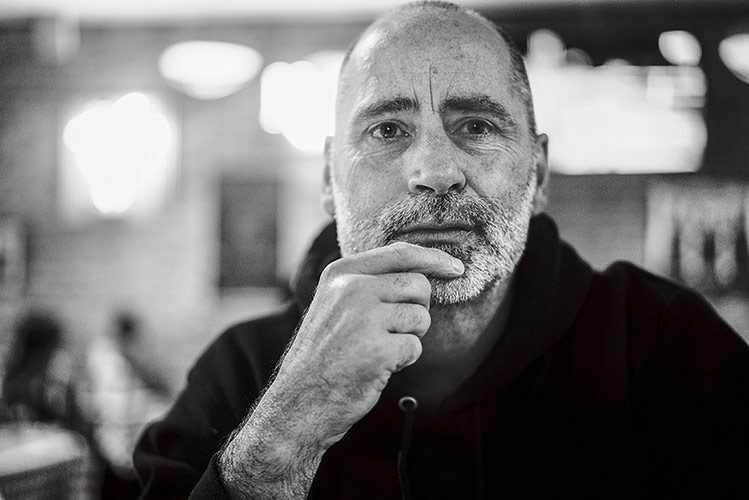 And just as he has no qualms with reporting his subjects’ shortcomings (he once facetiously asked Olivia Wilde why, as a vegetarian, she wasn’t skinnier and told Christian Bale he didn’t like his new movie), Donnelly freely exposes his own vulnerabilities. So, when we invited Donnelly to interview himself, we knew he wouldn’t pull any punches. You’ve said you hope this book could add to the canon of bathroom reads. Everyone knows you’re an egomaniac; don’t you think more highly of your work? I’m glad you ask that, Joe. When I said that, it’s precisely because I think so highly of my work. Let’s be real, anyone who lives in a busy household knows the bathroom is a sanctuary. I’ve done some of my best reading in there. What an honor if someone thinks this collection is worthy to occupy that precious space and time (it is!). Plus, I learned about narrative journalism and profiles by sneaking the sports pages off to the bathroom. Maybe someone can have the same experience with this book. It’s gotta’ be better for you than Instagram. Despite the marquee names, half of the profiles focus on lesser-known subjects, like the epic story of redeemed outlaw Eddie Padilla. How’d you pick whom to include? Well, I was fortunately limited by what was readily available on the Internet. I’m old enough that a lot of my career predates the digital age and while there were some worthy nuggets from back in ye olden days, tracking those pieces down would have been more work than what I was getting paid for (which, so far, is nothing — so buy the book!). Also, the digital era coincided with the lion’s share of my Los Angeles–based journalism career, so it’s only natural that a certain amount of it would be based on the entertainment industry. You use author’s notes to provide context to a lot of the stories. What’s a behind-the-scenes tidbit about the book? The hidden secret of some of these pieces is that I was driving around town in a battered, metallic blue, Ford F150 with a camper top. 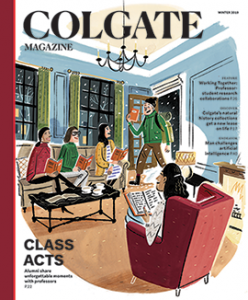 If anyone got a look at me, they would think I was a modern-day Beverly Hillbilly — which won’t surprise some of my Colgate contemporaries. It was not a cool ride in L.A. In the Christian Bale piece, you say you’d previously pledged to never do another celebrity interview. Why? I always think I’m going to hate doing them. And celebrities can be boring. I got into journalism to write about the struggles of real people trying to live in an often-daunting world, not about Christian Bale’s ability to lose or gain weight for different film roles. The celebrity thing became kind of a side-hustle that ended up just being the direction the horse was going in for a while. But I learned that these folks are real people too, with struggles and stories. If you show up and actually listen, you’ll get to those stories and they can be illuminating, entertaining, and even inspiring. Favorite person he’s interviewed: Can’t pick just one: Craig Stecyk, Sean Penn, Lauren Weedman, and Werner Herzog. His short story “Bonus Baby” was included in The O. Henry Prize Stories 2016. Teaches journalism and English at Whittier College, where he sometimes plays acoustic guitar in class. To make ends meet: has worked as a short-order cook, cleaned houses, and even swept a few chimneys.